AMotD (Awesome Moment of the Day) Umm… still waiting for it. 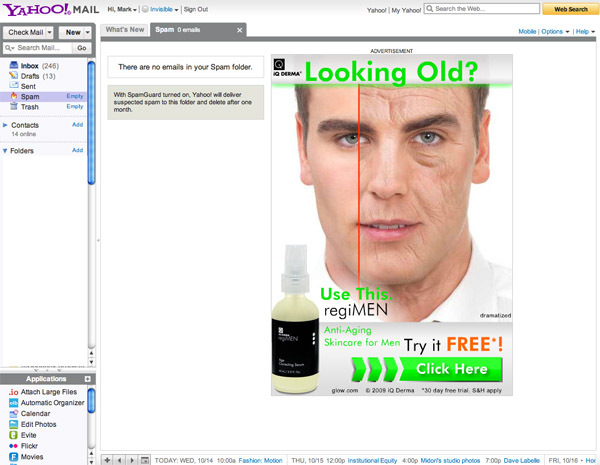 Aside from the ad Yahoo served up this morning with my email (see below), today got off to a decent start. Managed to get to the printer in time to run off some not-terrible prints for class, and celebrated stuff with a lemon cheese croissant and a coffee on the way to class. Things went downhill from there. This is the ad Yahoo served up this morning. How humorous. I’m having a hard time hitting the right note with Fashion photography. I don’t want to do the simple “THIS IS A LOUIS VUITTON HANDBAG! LOOK AT ME!” obvious product shots. I’m actually trying to put effort into creating a story to the photos, with more interesting concepts and setups. Plus I don’t have a Louis Vuitton handbag. Despite me drawing inspiration from this style of ads I’ve seen in Vogue, Rolling Stone, W, and some other publications, my professor doesn’t feel I’m “getting the fashion”, and based on the ones he selects as the “best in class” each week, I can see why he feels that way. I just think I disagree. But I’m a first year grad, so who am I to say? Anyhow, got a crappy grade on the latest assignment, and since the one I turned in today is in the same style, I can hardly wait to see its grade next week. I actually managed to crank out a few items for the next Publication Design class, somewhat ahead of schedule and one piece more than required. The assignment is “self-promotion”, and gives us a chance to create business cards, portfolio CD covers, etc. I’m starting with business cards, letterhead, and a new website front page, all of which will use the new-ish elements from the resume project to maintain a consistent house style. I still need to tweak them, as always. People keep trying to get me to put a tagline on my name. “Photographer”, “Visual Journalist”, etc. Is that me? Do I fit into those categories (or any others, for that matter?) I don’t want to label/pigeonhole myself. I’m 36 years old (yeah, yeah) I think if I was going to (be able to) specialize in something I would have done so by now. At this point I need to accept that and figure out how to ameliorate the consequences. Anyhow, puts me in a funk, reminding my what I’m not, what I haven’t done, won’t be. Picture Editing class turned into a discussion on Race and Diversity in the newsroom, with people telling me “race is out there, you need to realize that and be conscious of it.” Really? Wow, I’m learning all sorts of new stuff here at grad school! I just think that rather than putting attention on trying to somehow (artificially) introduce diversity into the news reporting how about just reporting on the news? If you do a competent job of reporting on what is happening – the entire breadth of what is happening – then diversity will take care of itself, will fall into place naturally. By focusing on “diversity” instead of “the news” you are influencing what you report on, hence the objectiveness of what you choose to report, and, I would think, even the content of the reporting itself. Reminded me of a West Wing episode where a female character was against the ERA and her liberal colleagues were aghast. “How could you not want equal rights for women?” Her point was she already had equal rights as a human – why do we need to specify further? Why do we need to artificially maintain diversity – we can’t possibly hope to manually balance it accurately anyhow – when if we are reporting the reality adequately diversity would automatically be accurately represented. By focusing on race like this – making it an issue in and of itself (in this context) it just perpetuates the divide. A classmate mentioned an article about a successful rich CEO or something that never once mentioned the fact that he was black – it was irrelevant to the subject of the piece. If we can operate on that level – rise above a situation that we have to manually create diversity – the conflicts will eventually (slowly, granted) resolve. On a different note, I did a time-lapse series of me setting up and striking camp last weekend. The audio/video virus has now officially infected my out-of-class life. Anyhow, I need to go take a picture of a Luis Vuitton bag. Ciao. October 14, 2009 | Filed under Grad school.